I made you guys something healthy. FINALLY. Zucchini Brownies. Sounds weird, right? Yeah. I hear you. But. 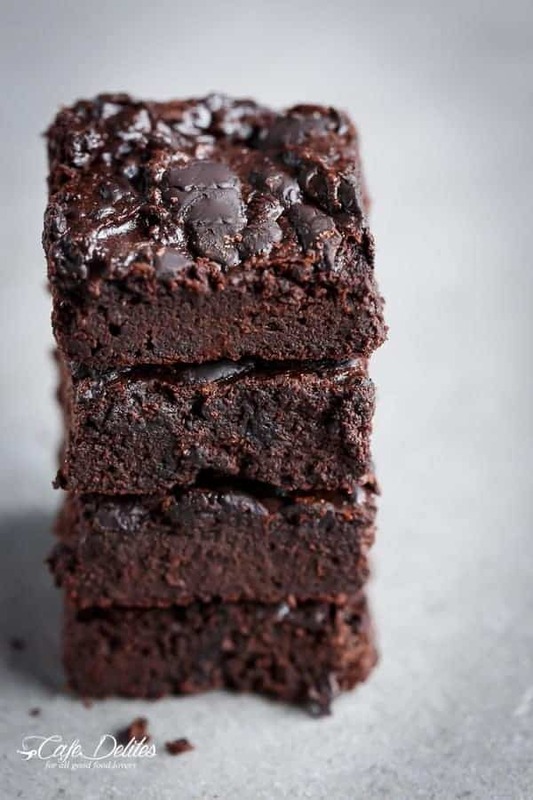 Let me just say…these are so incredibly moist and fudgy AND flour-less and healthy! All in one bowl! Hello low carb lovers! The bonus? Kids are eating vegetables without any clue whatsoever (*Insert evil laugh*) My kids are not exactly fans of Zucchini. They pick it out of their food as if I’m trying to kill them…even when I try and sneak it in. But low an behold they could not taste it in these. I won’t lie. The whole tray was gone in less that 6.2 minutes while watching trash TV in our pyjamas. And so easy to make my 6 year old could have done it with his eyes closed. These are low in carb but high in flavour; sweetened with Stevia or any other natural sweetener you have on hand. However, you can substitute the sweetener for coconut palm sugar to keep them refined sugar-free OR normal granulated sugar of you’re not watching your carb intake. These brownies are so addictive it’s possibly a good thing they’re low carb. Because you WILL want to eat an entire pan. And no I’m not exaggerating. 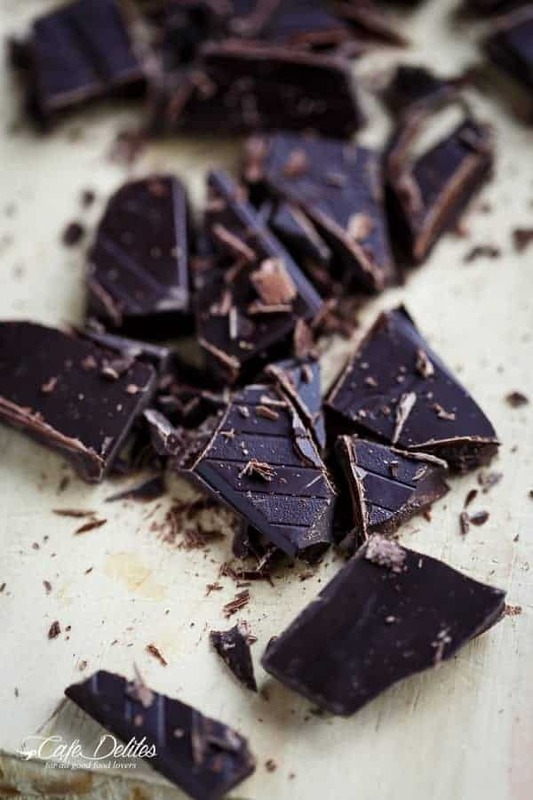 Top with 90% chocolate for extra rich decadence, or any chocolate chips of your choice. And feel free to skip the low carb ice-cream… No actually, don’t skip the ice cream. 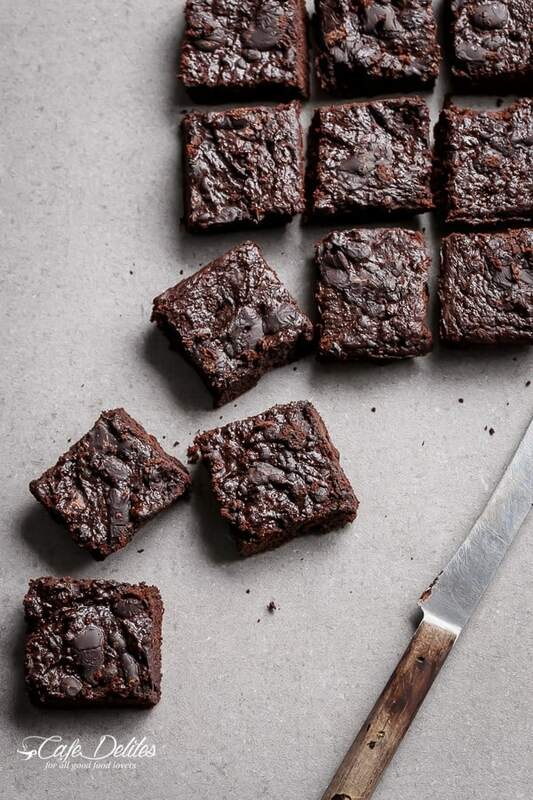 Weight Watchers: 2pp per brownie! Preheat oven to 176°C | 350°F. Line a 8x8" baking pan with baking?parchment paper, or lightly grease with oil spray. Set aside. In a medium bowl, whisk together the zucchini, butter, oil, egg, sweetener (or sugar), and vanilla until well combined. Add the peanut flour, cocoa powder, baking powder and salt; folding through slowly until just combined. The batter will be thick but shouldn't be dry. (It depends on how much liquid your zucchini has! If too dry, add 1-2 tablespoons of water). Fold in half of the chocolate chunks; pour batter into prepared pan; sprinkle remaining chocolate chunks over the top. If storing at room temperature they're best eaten within 2 days. If refrigerating, they last 3-4 days. Hi! I can’t wsit to try these! Can I sub coconut flour for the peanut butter powder? I saw not to use almond flour…thanks! I have not tried to use coconut flour before. Please let me know if you decide to try it and how it turns out. Thanks for following along! I added an extra egg and a 1/4 cup of flax meal. Came out amazing! Held together a lot better than the original recipe. Hi! OMG I love the recipe, I’m drawling already. I have only one question, can I use oatmeal flour instead of peanut flour? Thanks a million! Yes, that will work great! Let me know how it turns out for you! I have a peanut allergy – what can I substitute peanut flour with? You are welcome to freeze them. They may become crumbly since they don’t have much flour in them to hold them together through the freezing process. Could I replace the zucchini with pumpkin? IF so, how much? Your site is beyond amazing. I hope you venture more towards the low carb or THM way of recipes. I drool at every recipe!!!! You are so sweet! Thank you so much! Yes, you are welcome to substitute any ingredient to make it your own. I would use the same amount of measurements as the zucchini. Hope that helps! Is peanut flour the same as peanut butter powder? I don’t believe your carb count is correct. Have you doubled this recipe before? Could it be done? Best brownies I’ve ever had! I’ve been making these for the several months and they’ve turned out amazing each time! Even people who aren’t into gluten-free baking and healthier alternatives LOVE these! I use Pamela’s gluten-free pancake and baking mix instead of peanut flour. For sweetener I use maple syrup and sometimes a little bit of Stevia. I also add extra cocoa! These are amazing. Fudgy and rich! I made this and it tastes like a real brownie!!!!!! AMAZING!!!!! These are hands down the best low-carb chocolate desert of any kind that I’ve made. 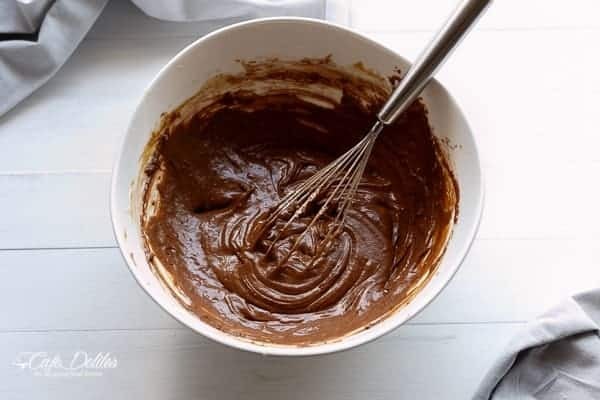 I sub almond flour for the peanut flour because it’s what I have on hand, use erythritol as the sweetener, and add a little more cocoa because I like them to be super rich- and they are! Have made them four times- they’re officially a keto staple!. Thank you SO so much for the recipe. 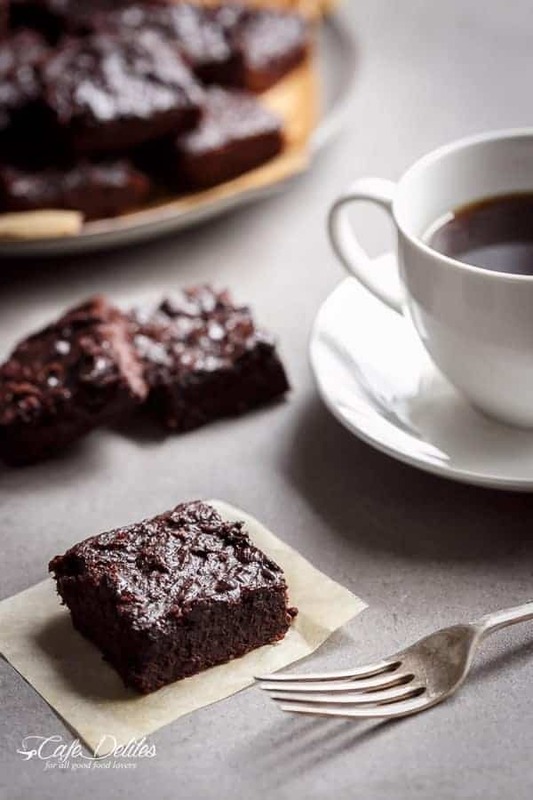 I made these brownies with pea protein powder and they turned out perfect. I also replaced the 1/2 cup of sweetener with liquid Splenda which has no carbs, as well as the 4 squares Lindt 90% chocolate with 4 Lindt Lindor milk chocolate truffles. 4 squares of Lindt Chocolate is 40g and 3 truffles are 36g. Altogether 1 brownie is 4.0 carbs. Do you think that I could replace peanut flour with some type of protein powder? Maybe pea? These are truly delicious! I feel like I’m cheating when I eat them, they are that good! Thanks so much for the recipe! Kids and hubby are afraid to try them because they have zucchini in them – yay! More for me! Haha 🙂 down 42 lbs and still losing even when I eat this for a late night snack. Woohoo! Hello, can you make these without the sweetener? Do you have sweetener free recipes? I cut out all sugar and sweeteners and I taste flavours so much more intensely…. It’s very hard to find recipes that work without it!! These look amazing. My question is when you make them with Stevia, how much do you use? It’s so much sweeter than natural sugar, I just don’t know what the measurement would be. Hi Wendi. I haven’t tried these with Stevia. I use a Sweetener that contains both Stevia and Erythritol that measures 1:1 cup for sugar. Any ideas what eh Sat Fat would be? Or what the SP value would be? No I’m sorry Dita. My fitnessmeals is a great tool to use for sat fat though! Im sorry last question I couldn’t find peanut flour so I bought hazelnut flour and almond flour. Which one would you recommend to use? I hoping the hazelnut but I don’t know anything about these other flours. I had a question that may have been answered already in the comments and I simply missed seeing it. I am not use to baking with anything other than all purpose flour but I am trying to move away from it. Can I sub almond flour for the peanut flour and is it a 1:1 thing? Does the rest of the recipe stay the same if I sub almond for peanut or does anything need to be adjusted? Thanks so much! It should as there are no soy beans in these brownies? So I’m on a low carb diet and a co-worker is gluten free. I’m wanting to make this for work and something that everyone can eat. Does this recipe fall under Gluten Free? Thank you. 1) when you grate the zucchini do you save all the fluid or drain it? 2) Is the Lindt 90% chocolate sugar free like baking chocolate or sweetened? I need to know because if I cannot find the Lindt, I need to know if I need to sub with another sweetened bar or if baking chocolate is ok? Hi Tee! I grated the zucchini with the finest side of the grater, so it turns into a puree. I don’t find a lot of liquid escaping when I do it this way, but if you find your puree too wet with water escaping, you can drain it on a paper towel. You shouldn’t have that issue though! It should turn into a puree while you grate it 😉 Also, you can use any chocolate you like in these! I used Lindt 85%, as the 90 was too bitter for my taste. You’ll have to google it to find out if it’s sweetened! That part I don’t know I’m sorry! what can I substitute for butter? Butter is dairy and I want to make the recipe dairy free. I made this for Christmas, and no one could get enough of it. No one knew it was zucchini, which is a plus because some, like my husband, refuse to eat zucchini. The kids LOVE these and they can eat as much as they want. I used almond flour instead of peanut, and used xylitol for the sweetener. This is a fabulous recipe that I will keep forever! SO SO SO GOOD! This recipe makes me so happy. Thank you! Hi there! I was wondering what type of sweetener you used as I’m not sure whether Stevia or Splenda would do the job or not. Thanks! I use a Stevia blend (either Swerve or Natvia). I hope that helps! My husband has a nut and peanut allergy and would freak if I used any type of almond or peanut flour. That being said, can I use just coconut flour or another flour? Just getting into baking to hid veggies from my toddler. Thanks! Hi Elizabeth! You can substitute it for plain flour (or all purpose), and add 2 tablespoons extra butter to the batter. I haven’t tried it myself, but the batter should still be nice and creamy. Please let me know how you go if that works! Am I missing something? The only flour listed is peanut flour. I see everyone talking about almond and coconut flour? I so want to make these but want to make sure the recipe listed is correct. They look delicious! I had almond and coconut flour listed as a substitute for those not able to get peanut flour, but have since then only listed peanut flour as my personal preference for the best fudgy outcome! I just made these tonight. I didn’t read the directions well enough and I squeezed the water out of the zucchini. That said, they still turned out moist. I also used 1/2 c. almond flour and 1/4 c. coconut flour. I omitted the chocolate chunks as I bought unsweetened chocolate and knew that they would turn out bitter. All else was consistent with your recipe. The taste is GREAT. I’m going to let them sit in the fridge for a few days (if possible…ha) and see if they get more fudgey. OH, and I made them in little muffin pans with little mini liners. It made 24 minis. baked at 325 for 20 min. That’s wonderful Jenny! I’m so glad they turned out for you! I have 100% chocolate, would I need to add more sweetener? Can’t wait to try this! Do you happen to know carb count per serving? Hi Talena… you’d have to add more sweetener yes as that’s quite bitter. Can you use cocunut flour instead of peanut flour?? Hi Jessica. No they will come out dry as coconut flour absorbs a lot of liquid when baking. You can try almond flour? Tried these. Followed the recipe exactly using the peanut flour (pb2) and my god. So rich and just amazing. Thank you so much! Love your stuff. Trying the hazelnut ones next. Hey Elaine! I love that! Kids having mho idea something is actually healthy for them is a really good thing 😉 Thank you for commenting! I’ll keep my eyes peeled on Instagram! Hi Karina I just made your brownies! I mean like I went to Walmart to buy coconut flour, almond flour, and a box grater to get the smallest holes possible….this was at 1am, I was like a dog with a bone LOL! Ok so I did everything as directed with the exception of using dark cocoa powder and I only had salted butter so I halved the salt portion. Oh and I mistakingly used a 9×10 pan instead of the 8×8. So the results were a very thin cake like (crumbly) and salty disaster! My dad liked them though lol. Now during the mixing process my batter looked nothing like yours. Yours looks creamy and smooth, mine looked grainy but not powdery. I also used as previously mentioned coconut & almond flower. I had added only 1 tbspn water to help smooth it out but that didn’t work. Can you tell me why you think my batter didn’t come out like yours? Please pretty please! I’m gonna try another batch but this time use the food processor to grate up the zucchini and see if that makes a difference…..Thanks 🙂 And I also didn’t peal the zucchini….hmmm maybe thats why! Ok off to the kitchen I go! Could applesauce be substituted for the oil and/or butter? Thanks! Hi Ashley you can definitely try it! Wow these look sensational girl! I could eat a whole batch right now! Yummmmmm! 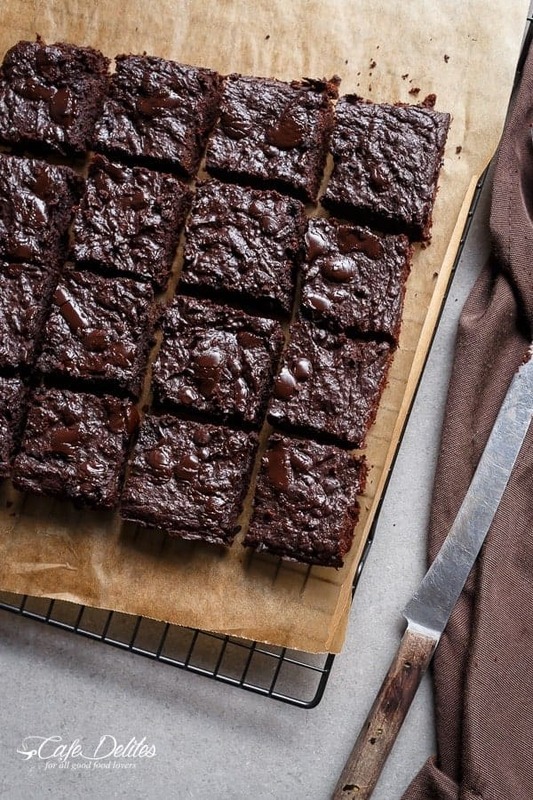 These look so dense and chocolatey and fudgy… Just beautiful! Becca they really are! 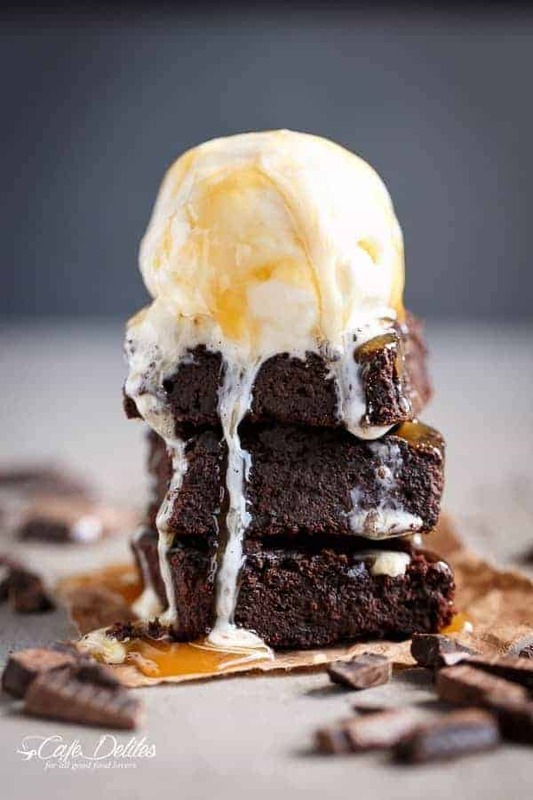 A cross between fudge and brownie! Could you sub all the flour with almond meal? Hi Wendy! You could try but they may come out soggier. The coconut flour helps to bind them when baking with almond meal. If you do try that I’d love to hear how they turn out though! Another alternative is to use almond butter! Hi! These look amazing and I was thinking of making them tonight! I just have a couple of questions. First, how much of the chocolate chunks should we use? I couldn’t find it in the recipe or description. And second, could I use regular flour or gluten free flour mix if I don’t have the others? Thank you so much! Hi Angela! The chocolate is missing from the recipe box on the mobile site unfortunately! It’s 40g | 1.4oz (4 squares of Lindt 90% chocolate) to keep them low in carbs, or you can use your chocolate of choice! Hey Cheyanne! Right? Eating them has the same effect 😉 Thank you! The longer they sit out, the fudgier they become too! It’s worth the wait, as hard as it is to wait with a pan of brownies. Thank you for pinning! Hi- I can’t seem to find chocolate in the ingredients list?! can I sub either oil or butter for applesauce? Can I use spelt flour? Also, can I omit the butter and just add more coconut oil? This looks great, thanks for sharing! Yes of course! Light Spelt would probably work best as I find normal spelt absorbs a lot of liquid when baking, however if using normal spelt flour, add 1-2 tablespoons extra oil (if you let the batter sit for 5 minutes in the bowl once all the ingredients are mixed, you will see the batter become thicker, and from there you can add the extra oil it needs until the batter is smooth again). I hope that makes sense! Please let me know how you go if you try them! Yes you can sub the butter for more coconut oil! That should work fine!